Chess is within everyone’s reach. Anyone can learn to play and learn to play well. You can develop as much skill as you’re willing to pursue. Struggles with chess are often the result of having learned the rules without having been shown what threats and opportunities to look for. These are easy to learn with the right teacher or coach. Chess is a gym workout for the mind—part of a well-rounded, healthy lifestyle. Chess is one of many skills that one can learn as an adult. A late start in life is no obstacle. Most marathoners begin distance running as adults, not when they’re 8! Chess is cultural capital—the modern continuation of a tradition that goes back centuries, through court and coffeehouse, pub and park. Chess offers a level playing field. Color, language and income have no power to change the rules of the game or to interfere with the choices you make on the board. Chess is a universal language. If you play chess, you’re connected to a community of players around the world as well as in your own neighborhood. Bill Brock (Treasurer) specializes in corporate and personal taxation. He has been a CPA since 1987. He also holds a Ph.D. in English (Loyola University Chicago, 1995) and taught in Loyola’s English Department from 1988 to 1997. At the age of 9, Bill played in the 1967 U.S. Junior Open Chess Championship and lost his first seven games before finally winning one. He has previously served as bulletin editor, treasurer, president, and membership secretary of the Illinois Chess Association and currently serves as an at-large board member. Brock writes frequently for national and regional chess publications, edits the Chicago Chess Blog, and teaches students privately. Chris Christmas (Director) has been playing chess for more than 45 years. He is a chess tutor and coach who has taught more than 1,000 students between the ages of 4 and 75. 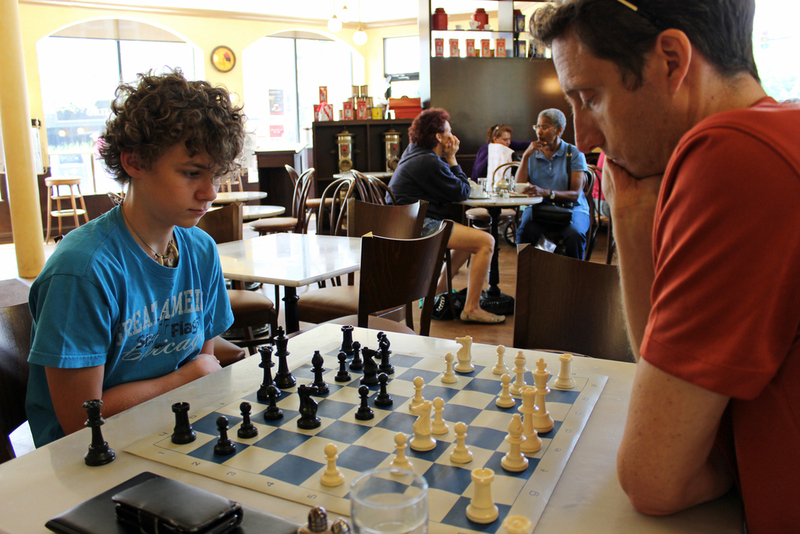 He teaches before- and after-school chess classes in Evanston and Niles and has conducted chess camps at the North Avenue Beach chess pavilion. Ani Emrikian (Secretary). Retired owner and President of ANI Safety and Supply, Inc., a national distributor of safety, janitorial and maintenance supplies. Her time is now spent supporting her 3 children and following her passion in education. Her youngest son, Aren Emrikian, won 1st place in the 2017 World Cadet Chess Championship in the U8 section. Jingwei Lou (board member) is a former top-tier management consultant with an MBA from INSEAD. He has extensive experience taking clients through large-scale strategy and implementation transformations. Jingwei is a lifelong chess player. During his undergraduate studies, Jingwei was president of the Northwestern University chess club. Adam Chambers (board member) works as a data analyst within the financial services industry. He also holds a Ph.D. in German. Adam has taught chess extensively from the elementary level through adults and currently mentors several younger chess players. Adam is a Class A/Expert player who plays prolifically in CCC and other Illinois chess events. Chicago Chess Center NFP Inc. is seeking to enlarge and diversify its board of directors. We’re looking for people who are committed and passionate, who show common sense and good judgment, who respect group process, who are centered and self-aware, and who have a sense of humor. As a startup organization, we need self-starters, risk-takers and freethinkers along with organized and dependable professionals. We need people with experience in fundraising, entrepreneurship, for-profit and/or nonprofit management, curriculum development, and/or marketing or public relations. Also, as an organization seeking to serve the entire city, we want to include members of demographic groups underrepresented in the chess community. For more information, please reply through our contact page. Your generosity will help us open our doors and ensure the viability of this new educational, recreational and civic institution. With your support, the Chicago Chess Center will provide regularly scheduled chess instruction and training for players of all ages, backgrounds and skill levels, along with a full calendar of U.S. Chess Federation–rated tournaments. Give a gift of $250 or more and become a a member of our Founders’ Court. You’ll receive all the benefits of membership plus free instruction, access to exclusive events and more. In addition, you and a guest will be invited to attend the grand opening of the Chicago Chess Center. Donate Botcoin (BTC) to Chicago Chess Center NFP, Inc.
February 2012: Chicago Chess Center NFP Inc. is formed. July 2012: CCC receives 501(c)(3) charitable nonprofit status. May 2013: CCC holds preview invitational tournament at Universidad Nacional Autónoma de México in River North and outdoor chess demonstration in Federal Plaza downtown. June 2013: CCC holds preview open tournament at Illinois Institute of Technology. July 2013–December 2014: CCC organizes coffeehouse chess nights in partnership with Julius Meinl. October 2013: CCC brings GM and two-time US Champion Alex Yermolinsky to Faraday School in East Garfield Park. April–May 2014: CCC holds Women’s Chess Workshops at Logan Square and Avalon branch libraries. June–August 2014: CCC presents Play Better Chess workshops at Learnapalooza in Wicker Park, Lakeview and Logan Square. November 2014: CCC holds second pair of Women’s Chess Workshops at Logan Square and Avalon branch libraries. November 2014–January 2015: CCC holds Magnus Carlsen for Amateurs workshop series at libraries across Chicago. January–September 2014: CCC organizes weekly chess meetups in partnership with Geek BAR. September 2014:German International Scvhool of Chicago chooses CCC for its afterschool program. April-December 2015: "Sojourn in the wilderness"; development of CCC business plan. January-February 2016: CCC offers a free, beginner-friendly series on the history of chess ideas from Morphy to Capablanca. held at six Chicago Public Library branches throughout the city. February 2016: CCC holds Pre-Opening Plus-Score #1 and Rated Beginners' Open / Scholastic #1 at University Center: 74 players in the South Loop!. February-March 2016: CCC offers a free series of workshop on chess tactics beyond the basics at five Chicago Public Library branches throughout the city. March 2016: CCC Pre-Opening Plus-Score #2 is the first of many tournaments held at the University of Illinois Chicago. April 2016: The Cindy Berry Memorial at UIC draws 57 players. May 2016: CCC holds Pre-opening Quads #1 (eight sections ordered by strength) at UIC. June 2016: CCC holds June Swiss and Rated Beginners' Open at UIC: 71 players. July 2016: By popular demand, CCC returns to Fight Club format with Pre-Opening Plus-Score #3 .Senior Masters Robert Perez and Alexander Velikanov take first and second, respectively. Due to a scheduling mixup, players "enjoy" mariachi music from next door. August 2016: CCC Interval Training #1 has nothing to do with anaerobic workouts: players receive a bonus thirty seconds per move (the Illinois Open uses a similar time control). September 2016: Local chess patron Daniel Parmet hosts GM Gata Kamsky workshops (five-time US champion, FIDE world championship finalist) for top Chicagoland youth: CCC provides funding for one workshop. September 2016: CCC hosts Scholastic #2 at UIC. October 2016: Teenage Senior Master Zhaozhi Li wins CCC Pre-Opening Plus-Score #4 at UIC. Six-year-old (!!) Aren Emrikian beats a National Master and takes clear second. November 2016: Associate NTD Maret Thorpe directs CCC Pre-Opening Plus-Score #5 at UIC. December 2016: Seventy participants slug it out: CCC Pre-Opening Plus-Score #6 amd concurrent Rated Beginners' Open #3 at UIC. January 2017: CCC partners with the Chicago Chess Foundation to host high school teams at the Six-on-Six Rumble at UIC. Free entry, free lunch, and over twenty chess books given as prizes! Febrary 2017: CCC Interval Training #2 at UIC warms players up for the US Amateur Team Championships. March 2017: GM Dmitry Gurevich and NM Gopal Menon dominate the field at the Isaac Braswell Memorial—City of Chicago Blitz Championship, held at UIC. March 2017: The CCC Rated Beginners' Open #4 draws 30 players of all ages. No charge and free US Chess membership to players with financial need. March 2017: CCC adds a beginner-friendly Under-1300 section to CCC Pre-Opening Plus-Score #8. April 2017: The Clark Street Capital Grandmaster Invitational #1 is organized by CCC. Clark Street Capital and Avant, Inc. are our generous lead sponsors. Grandmaster Ilya Smirin of Isreal wins with a dominating 7½-1½ score; Josh Colas of White Plains, NY, and Robert Perez of Chicago both earn International Master norms. April 2017: International Master Angelo Young won the 1st Haymarket Memorial at UIC. We awarded $4,447.81 in prizes, including $300 in Cindy Berry Memorial prizes for the top women players. May 2017: Adam Bareket and Alexander Parkel win their sections of our first Action Chess event (no prizes, just fun). May 2017: International Master Atulya Shetty of Michigan wins the Open Section of Plus-Score #9. June 2017: Leon Lang Cao wins Rated Beginners' Open #6 with a perfect 5-0 score. June 2017: Senior Master Zhaozhi Li and teenage Expert Akhil Kalghatgi tie for first in the 11o-player Plus-Score #10. June 2017: We gove a free workshop on back rank checkmates to East Chicago students at Vodak-East Side Library. Think Like a King software donated to Gallilstel Language Academy (thanks to Stephen Lipschutz and José Garza). July 2017: Senior Master Robert Perez goes 4-0 at Plus-Score #11. July 2017: Jason Shi scores 5-0 in the 32-player Rated Beginners' Open #6. July 2017: Jason Shi repeats his perfect score in the 34-player Rated Beginners' Open #7. Beginner no more! July 2017: IM Atulya Shetty completes his summer vacation in Chicago by sweeping Plus-Score #12. August 2017: Ronald Gil Arreola wins Rated Beginners' Open #8 in style, scoring 5-0. August 2017: Experts (now Masters) Zane Eisen and Aakaash Meduri each score 4-0 to win Plus-Score #13 ahead of two Senior Masters. September 2017: Lycée Français de Chicago chooses CCC for its afterschool program.